We’d love your help. Let us know what’s wrong with this preview of Gratitude by Dani DiPirro. To ask other readers questions about Gratitude, please sign up. This is a delightful little book that you can read through in half an hour or less. I am suggesting you don't though. This book needs to be savoured, read slowly and the thoughts in it need to be absorbed. Instead of just reading it, take time to really think about what you're reading and do the little challenges or exercises offered. I loved what this book had to say, I loved the quotes from famous people. I loved the top ten at the end. Gratitude is a frame of mind. Our whole type of thinking n This is a delightful little book that you can read through in half an hour or less. I am suggesting you don't though. This book needs to be savoured, read slowly and the thoughts in it need to be absorbed. Instead of just reading it, take time to really think about what you're reading and do the little challenges or exercises offered. Gratitude is a frame of mind. Our whole type of thinking needs to be adjusted to really being thankful and grateful for what we have. This book is the type that you can turn to again and again, just as a gentle reminder of all that we have, all that we can do, the people in our lives. This is a sweet little book with lots of thought provoking quotes, tips, and exercises that emphasize gratitude. The typography and art design of this book are both highly effectual. The minimalist, modern look is almost memorizing as you scroll through the pages. My only suggestion: Split the book up by days. I ended up speeding through this in about 20 minutes, but I think it would be much more powerful to break it up into "Day 1", "Day 2", etc, and have the reader read one section a day and r This is a sweet little book with lots of thought provoking quotes, tips, and exercises that emphasize gratitude. The typography and art design of this book are both highly effectual. The minimalist, modern look is almost memorizing as you scroll through the pages. My only suggestion: Split the book up by days. I ended up speeding through this in about 20 minutes, but I think it would be much more powerful to break it up into "Day 1", "Day 2", etc, and have the reader read one section a day and really digest what they read before moving on. Dani DiPirro's "Gratitude" is an attractive little book. It is easy to read and would make a good gift for anyone from pre-teens to adults. Some children may also enjoy it as well. I enjoy these little gift books since they are nice quick reads for before appointments, between classes, etc. Who doesn't need a little more "Gratitude" in their lives. I recommend this book for readers of all ages and think it would make an excellent gift, especially with the holidays coming. I won my copy from the G Dani DiPirro's "Gratitude" is an attractive little book. It is easy to read and would make a good gift for anyone from pre-teens to adults. Some children may also enjoy it as well. I enjoy these little gift books since they are nice quick reads for before appointments, between classes, etc. “Effortless inspiration for a happier life.” It has been scientifically proven that gratitude can be beneficial to both mental and physical wellbeing. It is also acknowledged that being thankful is difficult for many people due to negative circumstances or pessimistic personalities. Gratitude is a little, hardback book by writer and graphic designer, Dani DiPirro, whose purpose is to encourage the reader to show and feel more gratitude I received this book for free through Goodreads First Reads. “Effortless inspiration for a happier life.” It has been scientifically proven that gratitude can be beneficial to both mental and physical wellbeing. It is also acknowledged that being thankful is difficult for many people due to negative circumstances or pessimistic personalities. 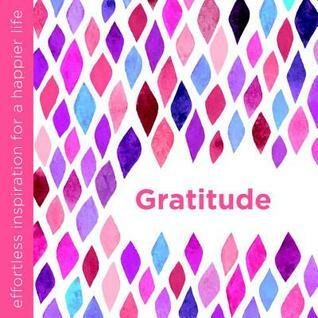 Gratitude is a little, hardback book by writer and graphic designer, Dani DiPirro, whose purpose is to encourage the reader to show and feel more gratitude in their lives. In a way, this is a self-help book. Using quotes, written insights and activity suggestions, DiPirro guides the reader through a number of situations in which one can be grateful. The author’s insights are sensitive but to the point, suggesting that everyone faces these problems, and does not isolate individuals. The quotes help to emphasise the points she makes and the activities are simple and relevant. The book itself is simply yet beautifully designed. The red colour theme makes it feel bright and positive; however will be more attractive to women than it would be to men. The print is large, clear and easy to read; suitable for all ages and backgrounds. Although roughly 130 pages, it only takes ten minutes to read from cover to cover. However, this is not the intention of the author. To get the most out of the book, each section/task should be tackled individually in order to experience the outcome you are hoping for: feeling a sense of gratitude. This is a book that you can return to time and time again, whether you feel motivated or need a little pick me up. At the back of the book DiPirro has provided lists of top ten ways to be grateful in different environments. These are useful for when you are experiencing problems in the home, or at work, and need help stepping back and seeing the bigger picture. Overall, Gratitude is a lovely, inexpensive guide to help people gain a more positive outlook on life. There are also other books in this series that focus on different areas of life that people struggle with; e.g. forgiveness and living in the moment. Gratitude is the ideal book to give as a gift to a loved one, or even to keep on your own bookshelf or bedside table, accessible when needed. I received an ARC copy of Gratitude by Dani DiPirro from NetGalley and Watkins Publishing in exchange for an honest review, and read the book as soon as I got it. I love everything about this book! The layout and graphic design of the book is eye-catching and very well done. The selection of quotes about gratitude are well selected, and I enjoyed the personal reflections and suggested activities. The list of Top Ten reasons to be grateful in a variety of situations, including during difficult ti I received an ARC copy of Gratitude by Dani DiPirro from NetGalley and Watkins Publishing in exchange for an honest review, and read the book as soon as I got it. I love everything about this book! The layout and graphic design of the book is eye-catching and very well done. The selection of quotes about gratitude are well selected, and I enjoyed the personal reflections and suggested activities. The list of Top Ten reasons to be grateful in a variety of situations, including during difficult times, is a great way to end this perfect little book. This is a book that you can read through quickly; but its lessons and reminders deserve to be savored and thought over and not rushed. It will make an excellent gift book for anyone (as we ALL need to be reminded from time to time to be grateful), and is a book that I have highlighted heavily and will turn to again and again. Gratitude is very "en vogue" so you may have heard of a lot of advices. It's also a way of seeing life that requires constant work on a daily basis. Reminding ourselves of the beauty of small gestures, of the importance of a smile or of a enjoying looking at a vivid blue sky can lift our spirits but only if we are able to stop, breath and appreciate what life is offering you. I've liked the quotes and the thoughts proposed by the author as well as the advices at the end of the book. It's a perfec Gratitude is very "en vogue" so you may have heard of a lot of advices. It's a perfect book to start seeing life differently and to practice gratitude every day. Light and easy to understand and to reflect on, it's a great companion after a long tiresome day when you feel blue or complaining about life issues. Overall, I thought this book was sweet. It would make a beautiful addition to any gift. It was very easy to read, had a nice message, and a beautiful cover. The whole downside to this ARC, and has no real reflection of the book itself, is the fact that it was a digital copy so I was not able to see any of the page formatting or page visuals (if any) which for some books like this one, can really transform it into something else. This is a beautiful little book full of encouraging quotes on gratitude. It is well presented and in an easy to read format. I loved all the great tips and easy exercises on each quote. This is a type of book I could read over and over thought out life and never get bored. It is very motivating and life changing. A great quote I love, “The thankful heart.. will find, in every hour, some heavenly blessings.” To always count your b I received this ARC via NetGalley in exchange for an honest review. Love the cover! It's definitely the type of covers that catch my eye when I enter a bookstore. The writing is pretty nice, but I feel like I expected something more. It's nice, but it can be better. And I hoped the illustrations could be more....special. But overall it's suitable for a present. 4 stars out of 5. I received an advance reader's copy from NetGalley. I will fully admit that the bright and cheery cover is what first drew me in, and the simple but effective text "Gratitude". This was a wonderful quick read but I also find it to be a great resource to assist in putting in the work to make positive changes. It is not only a very attractive book, it is an instant mood lifter. It's filled with great quotes and activities you can do to work on your perspective and attitude. This was a lovely colourful little book, that does make you think about what you have in life, what is important and how to appreciate it. Great little book on the importance of engendering an attitude of gratitude. Read through before bed last night and it was soothing and good to redirect my thoughts to a place of goodness, joy,thankfulness and peace. I got this book from NetGalley in exchange for a honest review. And thanks to Watkins Publishing. Once published, this book will make a great little gift. This is a very sweet little book that is very giftable. It has ministrations about how to practice more gratitude in daily life. The printing is excellent, and the colors are very attractive. This is a great little book full of encouraging quotes and small action steps to take, all presented with a fun, clean layout. Loved this book!!!!! What a very inspirational book!!!!! So very glad that I won this!!!!!!! I loved the quotes especially and can apply to every day lives. The second section asks the reader to tell people how grateful you are. This is followed by another affirmation and quotes. The next section addressed appreciation followed by a task to write down a memory. The author asks the reader to find wonderment in everyday experiences. She also advises to look for the positive instead of the negative and appreciate life. Dani DiPirro is an author, blogger, and designer who is passionate about living a positive life in the present moment you can learn more about Dani and her work at DaniDiPirro.com.